After a few months of damage control, Apple has opened its considerable purse strings to help remedy the situation at Foxconn, the chief manufacturer of its iPhones, iPads and other devices. Foxconn, China&apos;s largest employer with over one million workers in its stable, announced today that Apple will take on a share of the costs of improving conditions at its factories. "We&apos;ve discovered that this (improving factory conditions) is not a cost. It is a competitive strength," Foxconn CEO Terry Gou told reporters. "I believe Apple sees this as a competitive strength along with us, and so we will split the initial costs." Samsung, Microsoft, Dell and several other companies also rely on Foxconn for manufacturing, but Apple is its biggest and most influential client. 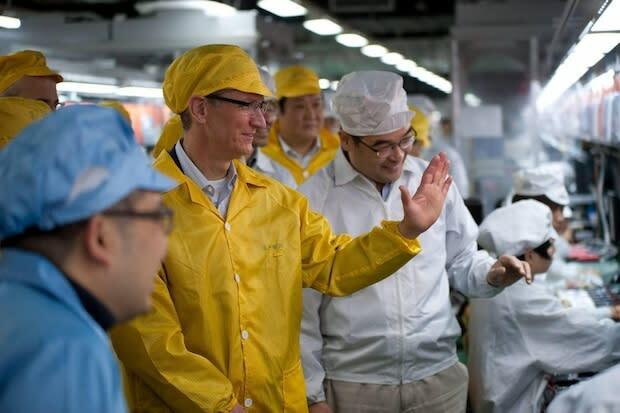 Earlier this year, Apple invited the Fair Labor Association to do an unprecedented audit of Foxconn&apos;s facilities, and CEO Tim Cook paid a personal visit in April— something Steve Jobs never did during his tenure. Improving conditions at massive factories like those at Foxconn won&apos;t be cheap— the company had already announced plans to reduce hours and raise wages for workers that could end up costing hundreds of millions of dollars. But whatever the cost, it&apos;s not likely to put much of a dent in Apple&apos;s famous $100 billion cash hoard. And the boon to the reputation of the world&apos;s most valuable company could end up being well worth it.